A pebble made a small crack in your car's windshield—do you want to spend $30 to fix it? This is just one of the many questions I had to answers while playing a new short game created by the Financial Times that offers a short simulation of life as an Uber driver. My mission: To make as much money while dealing with a variety of passengers and mishaps. 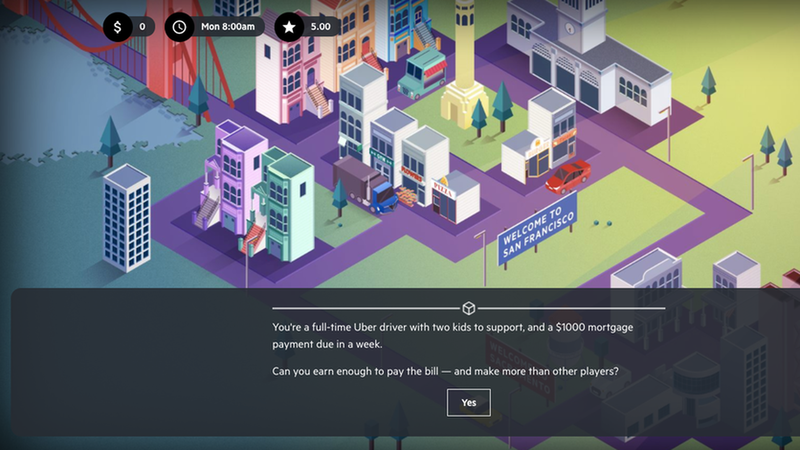 The bottom line: Designed based on interviews with real Uber drivers, the game offers a good glimpse into the long hours of driving and the complexities of the job, as the FT describes in this story. A full-time driver has to manage expenses, become familiar with traffic and business laws (don't forget that business license! ), and is constantly balancing Uber's game-like and financial incentives to drive more with sticking to sane and healthy hours. Following the rules is hard when it can lead to bad ratings from passengers. Flexible hours are great, but require more personal discipline (hard to say no to a social activity in favor of working longer). Even the smallest mistakes or mishaps, like a traffic ticket, can have a huge setback on earnings. Disclaimer: As a San Francisco reporter who has covered the ride-hailing industry for more than two years, I'm likely more familiar with many details of the job than the average FT reader who tries the game, including the need to get a business license in San Francisco, the level of traffic around the AT&T ballpark, and how easily a passenger can access the Caltrain station from a legal drop-off zone (all scenarios in the game). This also means that the savviest drivers have a better shot at making decent money as drivers.